This post has to be long. Sorry. Sort of. Before I talk about this book I have to share a story of my own. Once upon a time I was starting up a book club in town and invited various people to join in. One woman said that she would not join in the book club because if she suggested a book and it was discovered that someone else hated it, she would feel personally hated. As she explained, if you didn't like her book, you didn't like her. I find this logic highly flawed and still disagree with her. Lots of people do not like the books that I like. I don't feel myself hated as a result. Books and authors are different, stories are diverse and we, the readers, are not the same either. Before I say anything about The Beloved Harry Potter, I just want to point out that many people (some of you who read regularly) do not like or read my beloved Anne of Green Gables. And some of you don't even like Narnia. For these offenses, I forgive you. (grin) I do not find fault with you and I do not hassle you about these differences between us. I may be sorry we don't share the same loves but I in no way choose my friends based on which characters I like best. That said, for all the teens who find this post via Google and decide to take up a personal bloggy commenting vendetta against me or anyone who does not love everything that they love, please understand that there is no law that requires me to love Harry. But you may and I'm ok with that. The reason I felt compelled to pick at least Harry Potter and the Sorcerer's Stone yet again is because I host a Chronicles of Narnia Reading Challenge each July. And each July someone always asks me what I think of Harry Potter and tries to strike comparisons between the two series. Someone somewhere inevitably suggests that if I like Narnia so much, I'm somehow (by some undocumented law) required to be ok with Harry Potter. Having not formed a conclusive opinion for myself, I've never replied to such remarks. And meanwhile, many of my good, Christian friends go on reading Harry Potter and tell me how much they enjoyed the series (excepting the poor writing skills of Rowling). The story has appeal and I get that and I since I don't believe Christians are required to avoid Harry Potter - as there is such a thing as Christian liberty - I have had and continue to have no objections to others going on ahead and reading it. In fact, if my own kids approached me and said that they wanted to read Harry Potter, I wouldn't object. But - wait for it! - I would tell them of my concerns and have conversations about the books as they read along. The fact is, I do have concerns. Now, the chief reason I have always (before reading HP) and will always (after reading HP) object to there being a comparison made between Harry Potter and Narnia is a basic one: C.S. Lewis was a Christian and wrote Narnia with the idea in his mind that he would write about Christian truths in such a way as to make children familiar with them so that they would be able to connect dots when they became adults and encountered Christianity. He wanted children to be familiar with the themes of Christianity so that it would be easier for them to embrace the truths he found in the Bible. J.K. Rowling is not a Christian* and has never claimed to be writing a story for children which would enable them to embrace a faith of any sort. ** Rowling and Lewis hold two very different world views and approach their writings in extremely different manners. I would say that the comparison ends with: "They both wrote a story for children." That they did, but that doesn't make them twins and it doesn't cause me to read either story in the same light. I read Narnia for entertainment, yes, and for spiritual encouragement. I read (and possibly will read more of) Harry Potter simply for entertainment. The purpose behind both sets of books is completely different and being a believer in the fact that every individual on this planet possesses a world view and communicates it, my ability to compare the two series meets a rather frustrated end. I can't see them in the same light. But I am perfectly ok with examining Harry Potter as some good entertainment. I think that's perfectly allowable and acceptable in light of the aforementioned Christian liberty. Now, even though all things are permissible to me to read as entertainment, not all things are beneficial and so I read Harry Potter - for me personally - to see if it would be beneficial. By that I mean, is this a series which is going to be plain, good fun for me to enjoy with gusto, or do I need to not expose myself - individually - to the story? Will reading these book negatively affect my Christian walk? And please do keep in mind that I'm speaking individually - for myself only - and not to Christianity at large. The question I am asking is, "Is Harry Potter good for ME?" I'm going to have to argue that the answer for myself is no. I can't read Harry Potter for pure enjoyment purposes. Many can and I recognize and accept that. I cannot. I enjoy stories with magic in them. It is not that Harry Potter contains magic that makes me uncomfortable. Rather, it's the fact that so much of that magic is dark that bugs me. Whereas in Narnia, there is a very clear and definite distinction between good magic and bad magic, in Harry it's a little more hard to see between the two. Oh, I think Rowling makes her point clearly that there are good guys and bad guys. I'm not confused by her way of storytelling into thinking she did not make it clear that there was a very bad magician on the loose. Rather, it was all of the wizards, witches and spells that fill up the lives of even the good guys that rubbed me the wrong way making me wonder at times who really was good and who really was bad. When I look at Narnia there is a clear difference between evil and good. There are magicians in Narnia - Coriakin in Voyage of the Dawn Treader, for instance - but in Voyage Coriakin neither consults the dead, interprets omens or tells fortunes. He does have a book of spells in his home, which Lucy finds, which have spells for making people pretty or invisible or allowing them to overhear what others are saying of them in the present moment. But none of these things are on God's no-no list, according to Deut. 18:9-12 and all serve to teach Lucy more about how Aslan sees her. In the case of Harry Potter, he and his other classmates at Hogwarts are being taught spells for all sorts of reasons and situations - most of which are admittedly not known to me at the present. I suspect more is revealed in the following books. I think I'm left bothered because Rowling sets up a story which could go bad so very quickly. She stages a story which allows for divination, the telling of fortunes, etc. It is not a "safe" story and while we are by no means required only to read Elsie Dinsmore (the girl we Christians love to hate, right?) just to stay "safe" - there is some wisdom, I think, in cautiously treading into territories which create concerns for our spiritual health. The fact of the matter is, I believe that there is a spiritual battle going on here on earth. There is good and there is evil and the two are at war against one another. So when I read a book that is filled with talk of wizardry and sorcery, I'm compelled to pause and ask myself if reading it will make me too comfortable engaging myself in a situation where there is room for a great amount of evil. Read everything I've said correctly now, please and thank you. I did not say Harry Potter is evil. I said that there is room for this story to grow into plenty of evil and because I think that Rowling chose characters that are generally representative of things we find "scary" - i.e., witches, werewolves, wizards, etc. - not to mention "dark" and generally evil or wicked, and gave them central focus in her story, there is reason enough to be concerned. In Narnia, specifically in The Lion, the Witch and the Wardrobe, there is an evil witch who creates the tension for the story. She is evil and everyone knows it - every single character knows it as well as every single reader. It is the mission of the book to see her destroyed and to see Aslan victorious. In Harry Potter, it's hard to tell who is good and who is bad. As it turns out, the guy who you think is evil throughout the whole book turns out to be the good guy! And the guy you thought was good, turns out to be bad! Because they are all using spells and incantations, that just sits wrong with me and I am indeed bothered by it. That to say, I can see why Christians are concerned and pause whenever Harry Potter is mentioned. And I can see why Christians don't want to touch Potter. And I'm perfectly ok with anyone who says that Potter is not for them. In fact, I'll say it also: Potter is not for me! I've heard that this series ends well and that it ultimately is a story of redemption. The only reason that I'm not going to say that I won't read it is because I might find myself with good reason to in the future. However, at the present, I don't feel very inclined to read onward because I don't find that Rowling makes a clear enough distinction between good and evil - (sometimes blurring the lines) - and surrounds and inundates her reader with the idea that wizards and wizardry are fun things that you can play with. Since I do not agree with her that Halloween, wizards and sorcerers are fun imaginative things, I'm going to stop reading - for now. One thing I do expect is that there will be more conversation about Harry Potter in the future. I will not claim my above remarks as conclusive as I've not finished the series and I'm told the story is redemptive. That said, I'm also not one who believes that you "have" to see a movie to declare it "bad" (Showgirls? I don't need to see it.) or read a book series to say that there is reason to be concerned. Christians are called to be discerning and we don't have to save our discernment until after we've exposed ourselves and left words and images permanently engraved upon our minds and imaginations. As a Christian, I am called to think about what is good, pure, and commendable and I am to set no evil thing before my eyes. I'm supposed to try to figure out what is evil before I expose myself to it. (It's called w.i.s.d.o.m. See Proverbs.) While I'm not saying Harry Potter is out-and-out evil - I think he runs close to the line and I'm not comfortable dancing to the edge along with him. Again, I'll remind you lovers of Harry Potter that you aren't required to love Anne or Narnia and I won't spit at you. Don't get too crazy in the comment section. I'll say again: I don't hate Harry. I just cannot say that I like him much. I am....suspicious. Still. * Rowling has claimed to be a Christian but read my follow up comment in the comment section explaining why I think there is a problem with her claim. ** My sentence - as originally written - has been updated and edited to further clarify my meaning and what I was trying to communicate following a comment from a reader. I think whereas the magic in Narnia or Middle Earth is transcendent--a reflection of a spiritual reality--the magic in Harry Potter is meant to be purely technological. It's neither good nor evil, like televisions and cars. It's just a way people have figured out to manipulate the world; when it is used by good people for good ends, that is good, when it is used by bad people for bad ends, that is bad. I notice that most modern books of magic take this approach: whereas in the older books an ordinary child would meet magical beings, today the child *is* the magical being. I suspect it is because we, in our present time, are wrestling so much with the overflow of technology and information and what do we do with that? How do we use it without becoming consumed by it? How do we decide what the right thing to do is when we can simply do so much more than could be done in the past? I think if you read the series all the way to the end, and realized that magic was not meant to be spiritual at all in the series, you would find the moral ambiguity dissipate. I actually watched only the movies for the first three-four books and then read the rest of the series, because I was pretty sure I would find the first books too tedious. It's not the greatest literature by any stretch, but I found it on the whole worth the read. I respect your insight and ability to convey it reasonably and well. I've never been comfortable with Harry and was known as the parent who would oppose it if brought up at school as a read for the entire class. I didn't care if others read them as a personal reading choice but I opposed it being required reading especially in a school district that labelled themselves as Christian. But I never knew how to convey my thoughts so reasonably. I wish I would have had this post handy when I was asked the very same question between Narnia and Potter by a teacher. But I do respect your opinion highly when it comes to books. I think the differences you highlighted would probably keep me from enjoying Harry Potter. So thank you for clarifying the issue for me. I had a great response, until I read the comments and found that, yet again, Carrots beat me to it - and did it better that I could. I would note, though, that the sort of person who would take the dislike of a favorite book personally is probably the sort of person who would terminate a friendship over political or theological differences. My life would be boring without anyone to challenge my viewpoints on all of the above. I haven't read any of the Potter books yet, but probably will at some point. Thanks for the thoughtful review. I have read all of them, but I've never been blown away. I think you make a lot of good points here. This is the logic I can't get over. All practice of magic and sorcery in the bible is evil. Rowling creates a world where some practice of magic and sorcery is evil, but some is good. How would Christians feel if she had done the same thing with homosexuality? I've come back to that argument again and again, and because I have no answer to it, I'm inclined to think that Harry Potter (while not evil or wrong) isn't very wise. I TOTALLY agree that you don't need to read/watch something to know you won't like it. I haven't read 50 Shades of Grey and I haven't read Twilight. I don't plan on doing either. I am not sure I'd completely agree on the inferiority of Rowling's writing though. I don't know if it stood out to me as the best writing ever, but I think she's somewhat clever in certain ways. I have no reference to back that up other than, "it didn't stand out to me as bad." This is certainly the best article I've read that gives reason to the concern. Well articulated!! I think the first four books have to be read as a whole, it's not really until the fourth book that you see how Rowling wove the beginnings of many future happenings and epiphanies into the first books. That's when you see the "clever". I have always been amused by the Christian world making comparisons between Rowling and Tolkien or Rowling and Lewis, to me, there is NO comparison. Rowling will never be capable of writing with the depth of character that Tolkien and Lewis had. They understood the human spirit as it related to other humans as well as our Maker, there is a line between good and evil and GOOD will always overcome evil! Someone gave me a book called Frodo vs Harry, I have never read it, I flipped through it once. I just don't see the need to compare excellent writing with somewhat good writing! Like the time I saw The Two Towers rubbing spines with a Stephen King novel on someones bookshelf, I itched to separate the books so that they couldn't touch, they are worlds apart! I like that QoC pointed out the "technical" magic. That does seem to be what Rowling is going for. The reason I didn't FINISH the series is that the darkness in the fifth book was so much thicker and full of despair than even the fourth book. Plus, she killed my favorite character. I love the musical score in the movies, its very well done. (I've only seen the first two movies.) The first one is a pretty good representation of the book. I don't much care for the Narnia books, probably because I read them as a teen/adult and thought the distinction of good/bad characters was too pronounced. In the real world, the difference is more subtle- we are all sinners, and even those who don't accept Christ have natural grace. We'll see if i like them better as I read them with my children, for whom they are written. Of course, I didn't think the Harry Potter books were amazing either. I read them because they had the virtue of staying open on their own (I read well-used library copies) while I pumped breastmilk for the twins. I haven't read or watched any of the Harry Potter books or films, either, as I have the same concerns and convictions you do. If my children had strongly wanted to read/see them, I would have looked at them, and part of me wants to be "in the know," but the greater part would rather just leave them alone. I did wrestle with the "magic" of Narnia, as you may remember, and have seen people compare it to HP. But I agree with the points you made about magic. The witch in Narnia is not like witches in real life and good and evil are clearly distinct in Narnia. It's been years since I've read this series, but back then I LOVED it. I'm not ashamed to admit that I thought Rowling did a brilliant job of weaving together all the little details. I've held her in high respects as an author for THIS series. (After her new book, that is declining!) Again, though, it's been years, and I have wondered how comfortable I'd be with it if I read it these days. My reading has been fine-tuned a bit. I've been really curious what you'd think about HP, so I'm glad you read it. I've always told people the more into this series you get, the less of a children's story it is. It does get VERY dark and evil towards the end! I have never had the slightest interest in wanting to read the HP books, but lately I've been wondering if I need to read at least the first one so that I can relate to the gazillions of people who have read them. Thanks for your thoughts. Thank you for sharing your thoughts. : ) I have read the books numerous times and enjoy them, but that's different than handing them over to N1. We have recently told her that if she's interested she can read the first book, but so far other than putting it in and tacking it out of her nightstand stack, she hasn't made any progress on it. And I'm more than ok with that. For entertainment's sake, these books have been fun. As a spiritual analogy, not so much. : ) And, since it's been many years since I dove into the first one, I'm finding my interests are changing and I'm wanting to spend my time reading books with more meat that make me think as opposed to books about misbehaving children where everything works out ok in the end. I see enough of that in my everyday life. : ) Hee! So glad you wrote up this post! The work of John Granger has also helped me see the similarities of classical structure in English fantasy literature (i.e. alchemy and symbolism). I am wondering about your statement regarding Rowling's personal beliefs as she has on several occasions said she is a Christian, attends church and struggles with her faith just as millions of others do. She says she really struggles with the concept of life after death. The concept of life after death is not just a little tenet in Christianity - it's the main, big one. The grand big deal. Jesus conquered death so that we could live with Him. Remove the idea of life after death and you do not need a Savior because....why? There's no point. Again, she says she struggles with her faith and this "basic" (but very, very huge tenet) of the faith. She says she wrestles with this. I don't see where she firmly believes in the need for a Savior which would then cause you to realize that you need to confess your sins. She appears to be wanting to live a "good" life so that ....good karma will come her way? She fails to see the reason and the need for a Savior and you cannot say, "I'm a Christian" while at the same time saying, "I see no inherent need for the Christ." It just doesn't work. Something huge is missing from her faith. Both articles also stress the point that Hogwarts was meant to be an inter-faith school (I can see that from Book1) and that she specifically did not want to point to *any one* religion. And if you claim its because of the scriptures on the headstones (yes, I read the spoilers) then you also have to acknowledge that Rowling said they were there because that's "a very British thing to do." We're doing Rowling a great disservice if we assure her she's a Christian when she struggles with the need for a Savior. 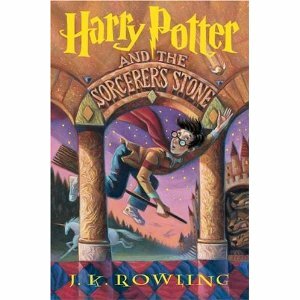 2) I enjoyed HP the first time through as a fun adventure, but the second time wasn't as "sucked into the story" (or the writing). 4) I appreciated her creativity--her imagination seems boundless! I kept thinking there would be no way she could keep this going, but she did. I can frequently anticipate outcomes to stories (and movies--annoys my kids to no end) but she kept me guessing. I didn't exactly take the issue with HP that you did at the time I read them, although, I had an interesting experience as I was reading them that leads me to come to almost the same conclusion. While I was reading them, the dark parts scared me (yes, I'm a wimp). I noticed as I progressed through the series I was having a lot of nightmares, and also at night I would be afraid, not of anything particular, but I just felt darkness around me and fear. I'm sure that sounds pretty silly, but I felt like I was under a dark cloud the whole time I was reading the series. I would pray and say Bible verses to myself, and that would help, but it only really went away when I finished the series. I'm torn, because I really liked the lighter parts of the series. I liked the characters, and I liked the story. The "good" magic in the books doesn't bother me, but the focus on the evil magic and the "bad" characters does. Rowling focuses so heavily on the "bad" guys throughout the books, that it's hard for me to say that I would advocate the series as a whole, especially since reading them affected me so negatively. I guess when I look at it in light of what you said - does this benefit me? I would have to say no! I thought of reading the series again sometime down the road, but, I'm not entirely sure that I will. It's been so long (sadly!) since I've been on your blog! I'm glad that you tried HP. I had an idea that you wouldn't particularly care for it. I love the series, and I think it's hard to judge the series by reading one book (not that you're claiming to do so!). I would be very curious to see what you would have to say if your read all 7 books, but then again, that's a HUGE commitment. Especially when I know that the later books get darker. But to me, everything is building to a point, with the first few books being more child's play. I think that it is possible to benefit from these books. There's a lot of discussion, particularly later on, about the struggle with evil from within. No, none of the scenes in Harry Potter are as gospel-real (if that's a thing) as in Narnia, but I wouldn't even venture to compare the two. Both Narnia and Hogwarts are worlds I'll keep coming back to...for different reasons. Thank you so much for this review. I have stayed far away from Harry Potter - books and movies - and I would be fine continuing in this line. However, my oldest son picked out a Lego Harry Potter book at the library the other day. He doesn't know what "Harry Potter" is but he was excited about the characters, castles, etc. I didn't want to say, "No! You cannot get that book! We are staying away from all things Harry Potter!" My son is smart, he would surely ask me why. I have decided to read the series so that I am familiar with something I am expecting my three boys to come into contact with. After I read them, I will be able to articulate why or why not they are allowed to read the books/watch the movies. I loved reading your review because I think we are on the same wavelength! I know you also have a son about my son's age. What are your thoughts on letting him read the books? Thank you so much for this review. I have stayed away from Harry Potter books and movies. It was my personal decision. However, a few days ago my second grader picked out a Harry Potter Lego book at the library. He doesn't know what it is; he just thought it was a book that gave building ideas. I was faced with a decision. Do I let him check out the book or not? And it hit me, this was going to become a bigger issue in the future: do I ban all things Harry Potter? With three young sons, this is a topic I cannot ignore. Therefore, I have decided to read the series. I want to be familiar with it, so that I can have an educated discussion with my children about why they can or cannot engage with Harry Potter. I should add that I am proceeding in this decision because I have Christian friends who enjoyed the series, and I also have heard the ending is good.